Just Another Natural, under jockey Francisco Calderon, winning the $435,680 TQHA Sale Futurity(RG3) Saturday night at Retama Park. 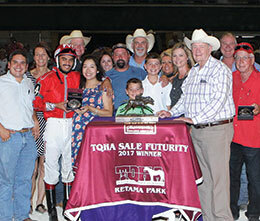 SELMA, TX—JULY 29, 2017—A wild and ​woolly running of the $435,680 TQHA Sale Futurity(RG3) took place this evening at Retama Park. Fortunately for Just Another Natural, the bumping took place to her outside, and with confident handling from jockey Francisco Calderon, she had smooth sailing to the wire. T C Flack bred and owns Just Another Natural, a daughter of Furyofthewind, a $9,000 TQHA Sale graduate who came into the final as the second-fastest qualifier from trials on July 14. She is trained by Leon Bard and tonight won her third race in a row. Calderon guided his mount from post position four in front-running fashion, crossing the wire of the 350-yard final in :17.614 seconds, one length in front of runner-up Ebrima. "She was in front the whole way," said Calderon. "I've ridden her in all but one of her races. She has always been a smart filly." Bard has always had high regard for the winner, who improved her record to three wins from five starts. She is out of the Streakin La Jolla mare La Natural Rona. TQHA Presient Bob Gaston presents the winning connections of Just Another Natural the TQHA Stake Futurity stakes trophy Saturday night at Retama Park. "When they said go, she was gone," said Bard, who is currently the leading trainer at Retama Park. "She's a little filly and T C supported my decision to wait on the right time to run her. It's worked out pretty well so far!" This was the third edition of the TQHA Sale Futurity for Bard; he won with Silver Gol in 2005 and ten years later with Grey Daze. The winner paid $7.60 and earned $193,878 for the victory. She now boasts a career tally of $213,078. 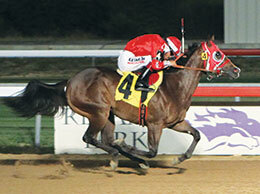 Bard said Just Another Natural will be paid late into the Dash for Cash Futurity at Lone Star Park. Ebrima, owned by Dimas A. Sanchez had her three-race win streak snapped this evening, but was game under jockey Damian Martinez. Bred by Bobby Cox, the daughter of Captain Courage broke her maiden at Sam Houston Race Park, then won an allowance before competing in trials on July 14. Out of the First To Shine mare McM Dont Look Back, Ebrima added $95,850 to bring her bankroll total to $108,548. Jose Espinoza's Shakem Bye Perry, with Manuel Gutierrez in the irons, ran third. Eusevio Huitron saddled the First Prize Perry gelding out of Shakem Bye by Dashing Bye. Bred by Garlyn Shelton, Shakem Bye Perry picke dup $47,925 for the effort. Runaway Heroine, also conditioned by Bard, was fourth, followed by Lj Fastest Time, Krash Course, Globito, Sugars First Love and Thebunnygoeson. Illusively Going under rider Eddie Sanchez finished sixth, but was disqualified and placed last for interference down the stretch. The TQHA Yearling Sale continues to offer excellent value for prospective owners. Past successful sale graduates include Oak Tree Special, Azoom, Snowy Alibi and 2016 champion Duponte. Bobby Cox bred the colt, who was purchased for just $6,700 in the 2015 TQHA Yearling Sale and won the Harrah's Futurity and $1.1 million Heritage Futurity (G1).